Douglas County Health Center has proudly served the Omaha area for over 125 years and continues to be a leader in health care in our community. 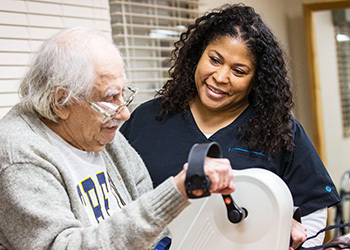 Our team of healthcare professionals provides excellent Long Term Care. We are recognized by the Centers for Medicare and Medicaid as a Five Star Rated facility. We are proud to be the only facility in Nebraska to hold that rating consistently since the inception of the rating program in 2008. Douglas County Health Center is nestled in the Historical Field Club neighborhood and is centered between two of Nebraska’s best-known hospitals and National leaders in acute care; The Nebraska Medical Center and the Omaha Veterans Medical Center. We are conveniently located in Midtown close to major shopping areas, the Old Market, interstate, and the airport.